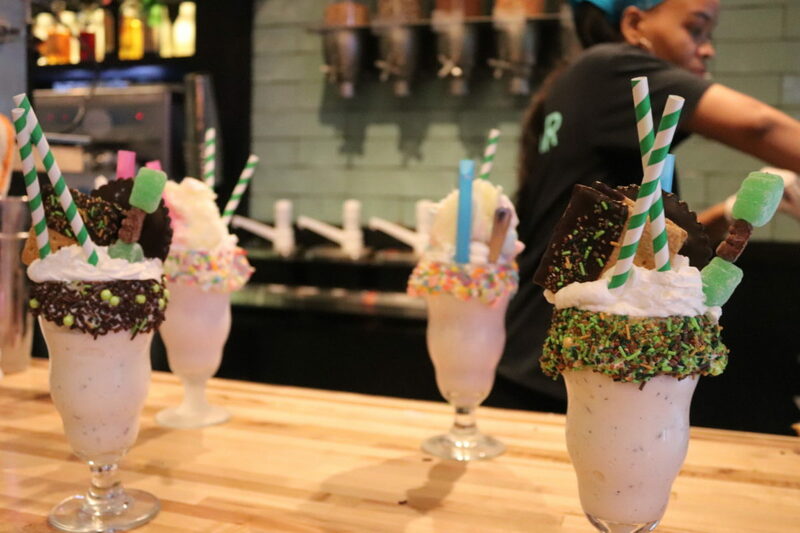 In a world where milkshakes are treated as little more than glorified beverages cranked into a cup by a machine at the pull of a lever, Jojo’s Milk Bar breaks the mold and turns milkshake-making into a delicious art. 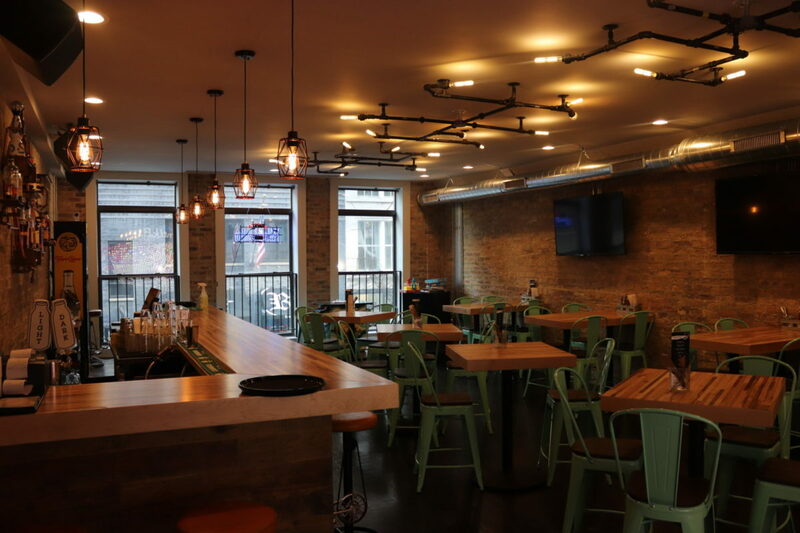 Located at 23 W. Hubbard St., Jojo’s can be spotted by the line of people out the door waiting for an open table. 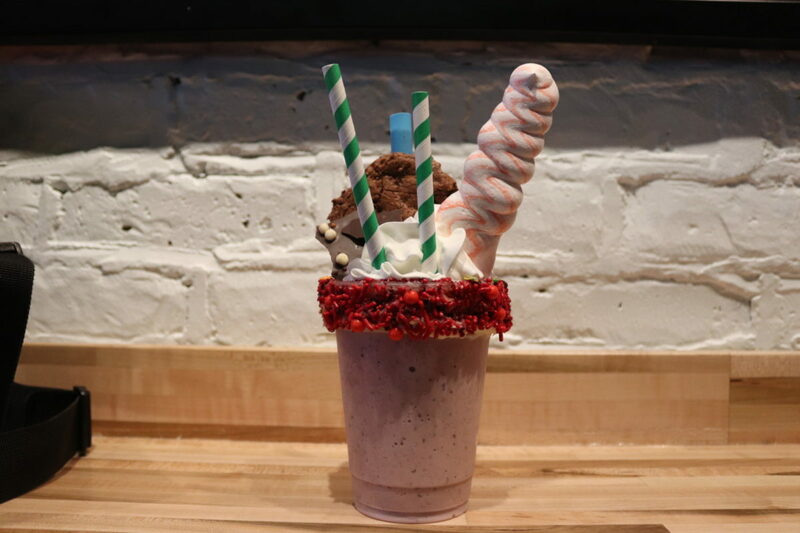 Opened Feb. 28, Jojo’s takes the concept of a milkshake and turns it on its head by adding other sweets and toppings to its mouth-watering creations. Inside, murals decorate the walls — with faces of celebrities and politicians, such as The Notorious B.I.G. and Queen Elizabeth II — while patrons choose between food items and milkshakes with all the trimmings. A dimly lit dining area and bar occupies the main floor, but the limited foot space makes moving around difficult. A second floor — open Thursday, Friday and Saturday and reservable for events — allows guests to sit back and relax. 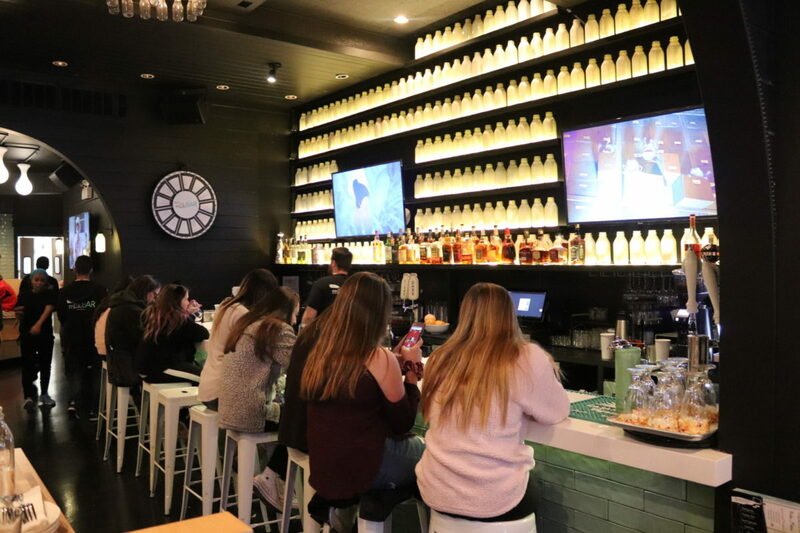 Patrons can watch a sports game on a television, bowl on a mini bowling lane, enjoy a drink at the bar, play a board game with friends or try to beat a high score on one of the two arcade tables. With multiple menu choices — including seven different milkshake and sandwich options at $14, and five supper options at $16 — customers can find their stomachs, as well as their sweet teeth, satisfied. Dine-in and carry-out options are available. After trying the Cherry Poppins and The Wonder Years shakes — which add cherry puree, cotton candy, chocolate Pop Rocks, marshmallow and more — as well as the Smash Burger — two beef patties with lettuce, zip sauce and American cheese between a house made brioche bun — Jojo’s doesn’t disappoint. All shakes at Jojo’s contain a vanilla ice cream base with extra ingredients added in. The ice cream itself is less sugary than the typical milkshake but the sweet additions make up for it. Mixing sprinkles and frosting from the rim of the cup into the shake puts the taste buds into overdrive. Listed toward the top of the food menu in an aqua blue box, the Smash Burger satisfies the stomach but doesn’t break ground in the same way as the shakes. Akin to a Whopper from Burger King, the burger seems like a supplement to the main attraction: the shake of choice accompanying the meal. 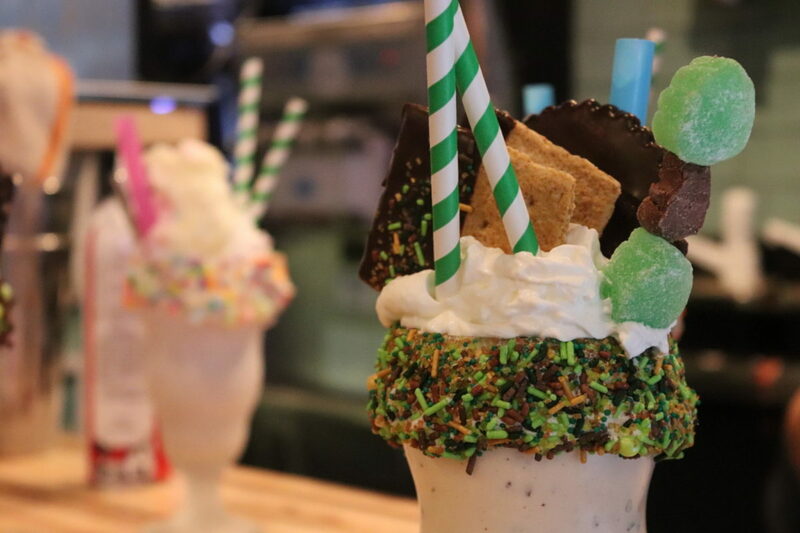 With an approach to milkshakes that’s anything but conventional, Jojo’s makes each ice cream-filled cup a trove of goodies meant for the next sweet-craving citizen. 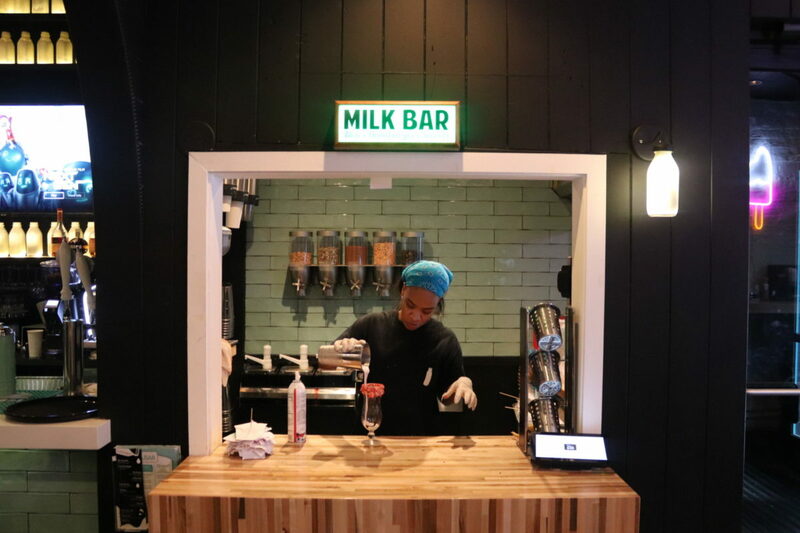 Jojo’s Milk Bar opens at 10 a.m. Saturday and Sunday and at 11 a.m. Monday through Friday. 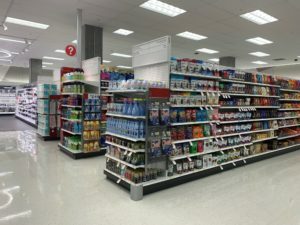 It closes at 10 p.m. Sunday through Thursday and midnight Friday and Saturday. More information and menu options can be found at www.jojosmilkbar.com.